Installing an asset is a critical step that can impact reliability short term and long term. Often times assets are installed without much thought. They are thrown on the machine base, anchors drilled and away the operation goes. 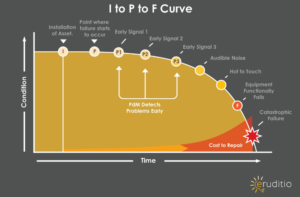 But while focusing on the Installation – Potential Failure – Failure curve, it becomes obvious that time and precision during the installation point can greatly extend the life of the asset. By investing in the installation, the asset will experience less premature failures and extend any wear out mechanisms that are present in the asset. Ensuring that the machine base is correct, can be addressed through three distinct areas. Machinery installation should be proceduralized so that the installation is performed to the same standard every time it is done. This involves developing standards for specific tasks, training the staff on the process and standards and finally ensuring that any contractors follow the same standards. It is only by using standards and procedures, can organizations ensure that machine bases are properly designed, and equipment installed correctly on them. Do you have machinery installation standards? What is stopping you from extending the life of your assets through proper installation? If you need assistance in developing, understanding and applying proper machinery installation, please contact jkovacevic@eruditio.com for additional information.